We already talked about using Atmosphere Aerosol for our promotional short film Vines in a recent blog post. Nevertheless, we wanted to share more insights on using and buying it in Europe/Germany. We created a video to show what the haze looked like before and after grading/VFX. One important factor is wind. Luckily the wind was weaker on the day of filming than on the day we made the test. Filling wide shots with haze was, therefore, not a big problem. Still, the haze moved out of the frame after around 10 seconds. This meant we either had to spray continuously or have to be content with shorter shots. Without wind or air circulation, the haze would stay visible for a long time. The official website states that one can of the aerosol lasts about five minutes and 30 seconds. We bought two cans that lasted almost the whole shoot. We always tried to use it thinking ahead, considering the wind and only spray right before or while shooting. While grading the short (which was done in DaVinci Resolve- read here about our grading workflow) we had to be careful not to lose the haze while adjusting contrast. The following part mostly contains information useful for people located in Europe, especially Germany. Atmosphere Aerosol is also the name of the company, located in Knoxville, Tennessee, that produces “Haze in a Can”. For a long time, you could not get your hands on it outside the US. Transporting aerosols by plane is prohibited. At the time of pre-production, we were able to order it in the UK (where it is produced for the European market now). The smallest available offer would have been over 70€, including over 20€ for the shipping alone. 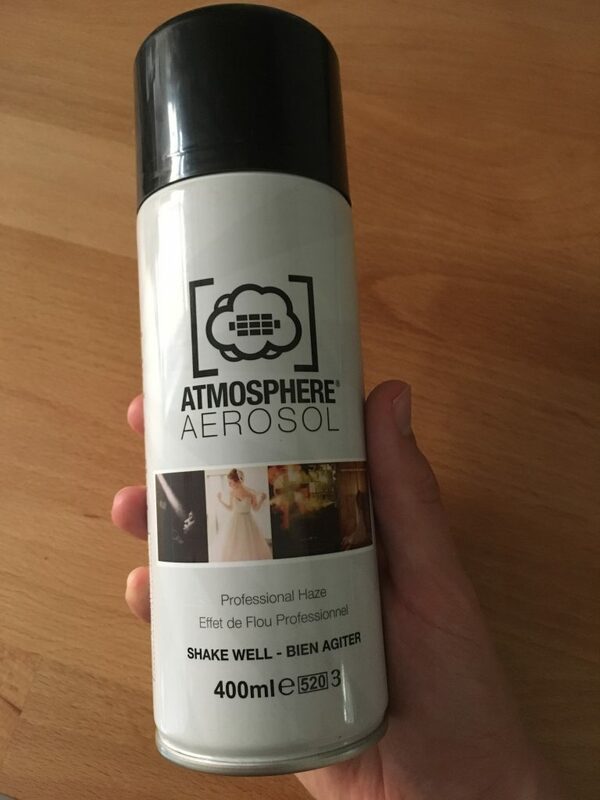 After a lot of research, we did find another website having Atmosphere Aerosol in stock and offering single cans. There we bought the two cans we used while filming at 12€ each, without any shipping cost. There is no point in linking that site. Unfortunately, they do not offer the product anymore. A year has passed and the situation is slightly better. The following prices are calculated with shipping costs to Germany but will be similar in many parts of Europe. For Germany, the best options currently include the official US/EU Website Shop. The official website does feature a list of other regional resellers around the globe. The overall cheapest offer, if calculated by Euro per can, is a 12-pack option from the official website. That offer has reduced shipping cost by almost 15€. One can would cost you around 13€ each, making it the most cost-efficient if you need large quantities. If you just want to try it out, the Dutch reseller Cameratools is the best choice. It does feature an offer for a single can that will take 21€ off your bank, including shipping to Germany. Sometimes you will find offers on eBay that are one or two Euro cheaper. But as soon as you need more than one, I do recommend buying it from the official website, despite the huge shipping costs. You can get a 3+1 or 6-can-offer for around 15€ a can, including the shipping cost to Germany. A similar 6+1 offer from the German reseller would cost around 18€ a can, including the shipping cost to Germany. If you are located in Munich you can buy it in a store called OMAHA Instant, according to the official website. You should definitely check the reseller page to find cheaper options in your area but do not be fooled by the huge shipping cost on the official website, some reseller add the cost to the product itself. A screengrab from the final film. Atmosphere Aerosol was the best choice for our project. It is lightweight, small and you do not need electricity, thus keeping the budget low. Battery powered hazers do not have a runtime that was acceptable or are – similar to gas-powered smoke-guns – too expensive. Most of the time we were able to create the look we wanted with Atmosphere Aerosol. For most people, it will be a good choice to bring beautiful haze to remote locations. We could not have created this look, using digital haze only. The only alternative that I am aware of is a product called Fantasy FX Spray. But we neither used it nor did we see it in action. We are not connected to Atmosphere Aerosol or any company mentioned in this post.